We would not be able to do what we do without these amazing people. They work hard year round to make Sierra Bounty happen for the short 16 weeks of summer. It is an honor to work with them, enjoy their amazing produce, and call them friends. 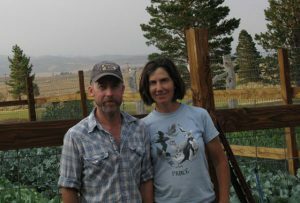 Joel Ellis and Kristie Nelson have been farming full-time at the historic Simis Ranch, northwest of Mono Lake, since 2006. Kristie has a background in wildlife biology, and as a staff member of the Point Reyes Bird Observatory, monitors California Gulls at Mono Lake. Joel worked over 10 years for the Inyo National Forest, also doing wildlife biology, and has lived and gardened on the Simis Ranch since 1993. Their vegetable garden is only about ¼ acre in size, around 10,000 square feet, but they attempt to utilize every square foot of soil through intensive double and triple-cropping. They also employ season-extending methods, such as low poly tunnels, cold frames, and even old wool blankets. They only use organic methods, although the garden isn’t certified as such. Crops that Simis Ranch produces for Sierra Bounty tend to be sturdy, cold-hardy ones, like potatoes, lettuces, spinach and arugula, onions, and carrots. Other vegetables grown, that you might see in Sierra Bounty produce boxes, include leeks, broccoli, kale, and shallots. Keys to their success in high-altitude gardening? Lots of composted dairy goat bedding, drip irrigation, livestock guardian dogs (which keep the deer away from the garden at night), knowing which crops and varieties can grow here, and having appreciative, informed, customers like yourselves. Thank you Sierra Bounty! Historically (in the late 19th and early 20th centuries) known as the Sylvester Ranch, the Simis Ranch is one of few remaining working ranches in the Mono Basin. It takes its name from its current owner, Jan Simis, who purchased the ranch from Albert Sylvester in 1957. The Sylvester family homesteaded and provided meat and produce to miners from the Bodie and the May-Lundy Mines. 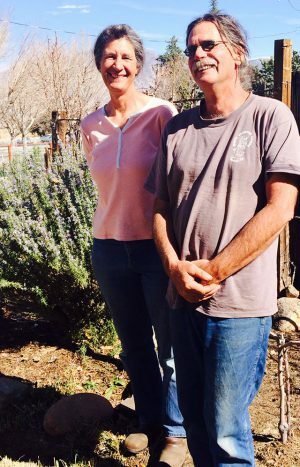 The current working ranch consists of about 10 acres of restored irrigated meadows, where Kristie and Joel graze goats, chickens, and in some years, turkeys. The remaining 125 acres consist of sagebrush steppe, and are managed as wildlife and natural habitat as part of a conservation easement held by the Eastern Sierra Land Trust. Seismic Gardens sprouted in 1994. We had recently moved to Big Pine and after 1 summer with a home vegetable garden we saw a notice in the local paper of a group trying to start a certified farmers market. We went to the meeting and decided to join the group. After that in a moment of serendipity, our elderly neighbor leaned over the fence and offered her backyard as a garden space. This unexpected offer soon led us to discovering small bits of growing land all around town. We were launched! Seismic Gardens reflects another aspect of Community Supported Agriculture not often considered. Martin and I are supported in our very local community of Big Pine by the generous offer of land to grow on. The land comes in many forms–from next door neighbors backyards to vacant lots otherwise collecting tumbleweeds. As our “farm” is spread all over town we do not have an accurate measure of how much area we grow but we are likely nearing ½ -¾ acre of cultivation. All intensively planted. Our philosophy of growing is working within the seasons and choosing which vegetables to grow; practicing crop rotation and using a wide selection of plant varieties, paying close attention to and learning about our soils, and actually eating what we grow to be in touch with flavors, crop ripeness and for our own enjoyment. We are not USDA certified organic but take serious consideration of the guidelines in our practice. We believe in minimal disturbance of the soils and work to arrange our gardens in a bed and path system. Any digging after initial ground breaking is with the broad-fork. All our other cultivation and weeding is handled with hand tools. Due to the very dry climate in our region, we use thick layers of natural mulch materials on the beds along with buried drip irrigation. Not only does this keep the soil surface moist and cooler, it cuts out weed growth and creates a thriving worm and microbiotic community just under the mulch. We believe in healthy soil, producing tasty and healthy vegetables, so we work to bring our soils into mineral balance and encourage soil life to provide a healthy place for the plants to live. At harvest and in the packing shed we cull ruthlessly to select the best quality to bring to Sierra Bounty, Farmers Markets and restaurants. Seismic Gardens vegetables you will often see in the Sierra Bounty boxes are yummy; juicy heirloom tomatoes, sweet peppers, tasty eggplants, mild crunchy red onions, carrots, cucumbers, summer turnips, green beans, beets and occasionally melons. Marci is a third generation farmer from Fallon, Nevada where she was raised on her family’s hay farm and cattle ranch. I have not been in the game as long, but I was born and raised on a small farm in Bishop with only a brief hiatus to Reno to pursue a degree in Rangeland Livestock Production. We started gardening more seriously in 2009 to try and grow more of our own food. We have expanded a little bit every year to where we are today. 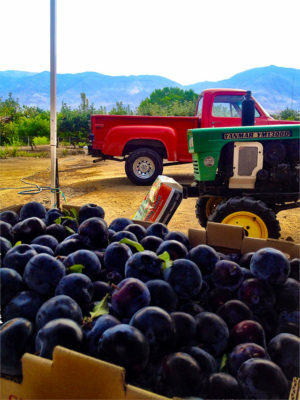 Our goal is to provide local, sensibly raised products to the Eastern Sierra. To accomplish that, we raise a variety of garden products that are seasonably available in our cold-desert climate. We do not spray anything on our produce, and insecticides are not used. In 2010 we set out on a venture to provide a local grass fed meat. We started with pasture raised Dorper sheep and have now added pastured poultry. A what sheep? Dorper and White Dorper sheep are a meat breed developed in Africa in the 1930’s to thrive, and come to market weight on the range. Many breeders in the United States have selected these two breeds for specialized grass finishing operations. Our goal is to offer the best pasture-raised meat product in the area. They want this nation to be healthy again and hope they can do their small part to help. Get inspired and eat like you mean it! White Mountains Ranch (WMR) is a historic ranch nestled at the foot of the picturesque White Mountains. They’re 19 miles NE of Bishop, CA across the valley from the famed High Sierra Mountains. It’s their goal to provide the highest quality meat available through the care only a small family ranch can provide. They only feed their animals the hay they grow! They’ve never used pesticides or herbicides in their fields. Heading towards self sustained agriculture, utilizing the bison’s own manure and only organic fertilizers. NO anti-biodics or growth hormones for their herd! WMR produces Alfalfa and a Grass/Alfalfa mix. You can always recognize their bails from their signature red white and blue bail strings. 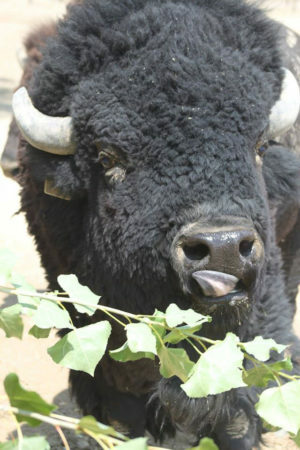 They specialize in bison, however also run a small but pristine herd of Black Angus – Pigs – Nubian Goats – as well as operating a small Hydroelectric Generation facility. Rick Devore, owner of Apple Hill Ranch started the farm in 1991. It was, and still is a hobby that has gone out of control. He has 17,000 trees including apples, peaches, pears, plums, walnuts, cherries and pecans. One of his fig trees comes from a 150-year-old homestead on the other side of the Owens Valley. 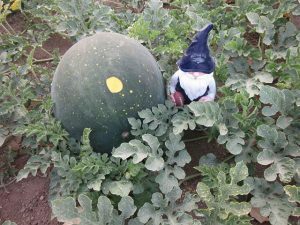 Devore also has five gardens on his property, growing a variety of produce including kale, beets, tomatoes, onions, cilantro, cucumbers, squashes, and beans. Certified organic ranch selling fresh fruit, vegetables, eggs, honey, jams and jellies.